It is that time of year again when Canadians say goodbye to summer and hello to the fall season. While this can be one of the most beautiful times of the year, it also means cold and flu season is upon us. A healthy, robust immune system is our greatest ally in fighting off what everyone around us seems to be struggling with. Do you ever wonder why we tend to get sick around this time of year? Traditional Chinese Medicine refers to fall as “Change of Season”. It is thought that a person’s immune system (defensive qi) can be lowered due to the change in temperature. Also, I would be remiss not to mention that, for most of us, the fall means “GO TIME”! Summer vacation is over. Stress levels at work and at home seem to hit high a note and that takes a toll on our immune systems. We soon start to feel the ill effects of our immune system struggling to keep bacteria and viruses from terrorizing our respiratory systems with hacking coughs and runny noses. IV Vitamin Therapy can be an invaluable therapy that can work quickly and effectively to boost your immune system by directly giving your body a cocktail of vitamins and minerals that it needs to fight off infections. Your adrenal system can also be a huge benefactor of this treatment. Sometimes fatigue that we experience can be due to deficiencies in our vitamin mineral status which our adrenals also need to keep us going. What is in a IV Vitamin Bag? The base for an IV Vitamin Bag is referred to as a Myers Cocktail which was developed over 30 years ago by Dr. John Myers, MD. This bag typically contains various amounts of the following substances and is put into a base of saline solution which is great for hydration. Each bag is completely customizable and based on the individual 's needs. B6 - Helps to increase mood. Low B6 has been linked to low immune function. IV Vitamin Therapy offers a route of administration that bypasses the digestive system and goes straight into the blood stream allowing for direct absorption by your cells. Higher therapeutic dose of vitamins and minerals can be delivered without causing stomach upset. IV nutrients can correct deficiencies much faster than oral supplementation. If you constantly feel like your energy levels have been dragging or you have just not been able to kick a cold that has been lingering for too long, IV Vitamin Therapy can be a fast solution. Treatments take place in our IV suite and a treatment typically takes about 30-45 minutes. During this time patients are encourage to use this time to relax and let the body heal. 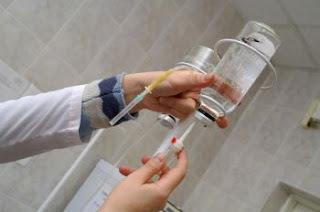 You can think of using IV Therapy as prevention from getting sick in the first place. If you know you are going into a stressful time or have an important event or trip coming up that you just can't be sick for, boosting your immune system and taking care of your adrenal glands is KEY. If you would like to book an IV Therapy session with Dr. Kimberley Ramberan, ND, please call Naturopathic Foundations Health Clinic at 905.940.2727. If you would like to learn more about IV Therapy, email kimberleyramberan@gmail.com or book a free 15 minute meet and greet.